How do I get to Sunset Beach at Lake Diefenbaker? Sunset Beach is located on a naturally gorgeous 150 acre parcel of land defined by the sheltered inlets of Dog Leg Coulee and Cooper Bay. The subdivision is situated on the East shore of Lake Diefenbaker, between the Village of Elbow and Gardiner Dam/Danielson Provincial Park. Click here to see our guide & directions to Sunset Beach. Getting to Sunset Beach – please see our guide & directions page. You are welcome to self-tour the site at your convenience; all available lots are well marked and a lot map and price list are available here. You can browse the pricing pamphlet here. What size are the lots? Sunset Beach at Lake Diefenbaker properties will be a minimum of 49 x 101 meters in size and many lakefront and 2nd row properties are 82 x 131 meters and larger. View our Subdivison Plan Map Stage One and Subdivision Plan Map Stage Two! Check out our new interactive map with lot information here! What are the steps in securing a property at Sunset Beach? Each purchaser will be responsible for their own legal costs associated with the purchase of a property, and you are welcomed to engage your own legal representation. Alternatively, Weber & Gasper is affordable, efficient and professional in its service to assist and represent you in the purchase process. They have handled dozens of transactions for us over 10 years of recreational development projects with ease and expertise and we are confident you will be in excellent hands. What do I get when I purchase a property? What does the Sunset Beach subdivision plan look like? Spacious, titled, lake properties with no time requirements to build that are zoned Recreational Resort, providing maximal flexibility to enjoy with an RV, park model, cabin or lake home. Is Sunset Beach accessible year-round? Yes, The RM of Loreburn maintain the main access road and internal subdivision roads throughout all seasons. Is there a risk of flooding on Lake Diefenbaker? The risk of flooding is extremely low. Lake Diefenbaker is a manmade reservoir that is 140 miles long with over 580 miles of shoreline. The Water Security Agency sets the environmental reserve level at a maximum high water mark and the water cannot exceed this level, with height and flow regulated by the Gardiner Dam. It is important to note that water levels can fluctuate significantly in a short amount of time. Lake Diefenbaker has exceptional water quality for water sports, fishing, and agricultural/irrigation purposes, among other uses. Click here to learn more about Lake Diefenbaker. Are docks and boat lifts permitted at the Sunset Beach development? Yes! The Water Security Agency (WSA) requirements and any associated permitting is the responsibility of the individual lot owner. Details regarding dock placement restrictions at Lake Diefenbaker can be found in the Water WSA fact sheet, which features the best management practices to design and build low-impact seasonal docks and boat lifts in order to protect aquatic habitat and surface water quality. Access the Aquatic Habitat and Surface Water Quality Protection Fact Sheet here. More information can be found in the Dock Primer Guide. Please note that construction and/or removal of a permanent dock or boat lift that is attached through permanent anchoring systems, driven piles, or other permanent anchoring systems to the bed, bank or boundary of a water body requires a permit from the WSA. If your proposed project is within municipal lands, you may require consent from the appropriate RM, Village or District authority during your planning phase (e.g. Municipal Reserve, Public Reserve, Environmental Reserve or municipal road allowance). What can be done on the lakeshore? Lot owners can develop within their property boundaries. As developers we have no jurisdiction on land governed by the local Municipality (Municipal Reserve or Environmental Reserve) and Water Security Agency (WSA). Any lakeshore alteration requires a permit that is available through the Water Security Agency. You can find the Aquatic Habitat Protection Permit Guidelines here. Further documentation is available at the Water Security Agency website. Where can I launch a boat? View the Boat Launch Map here. Will Sunset Beach have a Boat Launch? Planning and design of a private boat launch has begun to exclusively service the Sunset Beach Resort. Investigations into a future marina for Sunset Beach have also been initiated. Both the boat launch and marina are in the planning stages and updates will follow. Prairie’s Edge Development Corporation has already built a boat launch and 50 slip inland marina on our current project at Lucien Lake so we have experience in this regard. For information on Water’s Edge Marina at Lucien Lake, click here. Where is the Sunset Beach proposed boat launch site? Will this be a public boat launch? Planning and design work for a Sunset Beach boat launch has been focused in Dog Leg Coulee. This will be a private boat launch exclusive to development property owners. Please see the proposed site map. The sites are also marked with signs at the development - you are welcome to drive and take a look! How deep is the inlet in front of the Sunset Beach Development Site? Does it dry out? How deep is the inlet on the other side of the Sunset Beach Development Site? This inlet closest to Phase 1 of the Sunset Beach subdivision is named Cooper Bay. This inlet is very deep and does not dry out. The inlet to the West of the Sunset Beach development site is named Dog Leg Coulee and is also very deep, sheltered and does not dry out. Please see the 2017 depth map created by AE Engineering. What are the time requirements for building? There is no time requirement to build at Sunset Beach at Lake Diefenbaker. We offer exceptional flexibility to suite your needs. What are the building specifications, and what is a Building Specification Agreement? What are the steps to building in the RM of Loreburn? 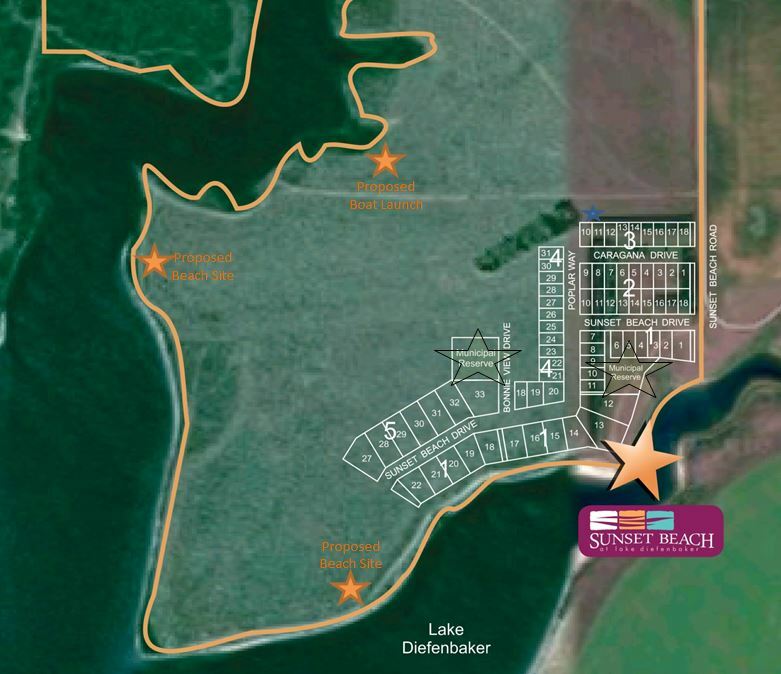 The Sunset Beach at Lake Diefenbaker Subdivision is Zoned Resort Residential. Comprehensive information on recreational resort zoning, developing, and building permits can be found here. In the early planning stages (prior to any building), you should be in contact with the RM of Loreburn. Their contact information can be found here. here. How can I find local builders and contractors? Is there a Geotech Report available for Sunset Beach? Yes - click here to view Geotech Report. What type of buildings are permitted on the lots? Cabins, RTM’s, park models or RV’s are all permitted in the Recreational Resort Zoned District of Sunset Beach. Is there a minimum building size requirement? There are no minimum size requirements for building in the Sunset Beach Development. All lot development and building requires a development permit and a building permit from the RM of Loreburn. See Building Specification Agreement and the RM of Loreburn Zoning for more information. Is there a minimum/maximum RV size permitted or an age/type/year RV restriction? No - standards in the Sunset Beach Building Specifications Agreement for RVs incorporate the RM of Loreburn Bylaws and Recreational Resort Zoning District requirements. Can I have a guest RV on my site? If I have friends/family that wish to bring their RV to my property at Sunset Beach is this permitted? Yes - guest RV’s are allowed. Property owners are permitted to use one Vacation Trailer from time to time for temporary sleeping accommodation of unpaid guests. Which lots are RV lots and which lots can I build a cabin on? All properties are designated as Recreational Resort Zoning within the RM of Loreburn’s Zoning Bylaw. This means that one principal use shall be permitted on any property including an RV, Park Model or Cabin/Lake Home. Further to this there are no time requirements to Build. Can I move a previously constructed building onto the property? In very select instances it is a possibility. All buildings to be located on the property must be of new construction, utilizing new building materials or approved in advance of placement on property by developers and the RM of Loreburn, with all upgrades complete. In certain instances, on a case by case basis, consideration will be given to existing buildings that have new exteriors (siding, roof, windows, doors etc.). Any and all upgrades must be completed prior to any movement onsite and strict aesthetic considerations by the developer will be adhered to. Can I Dig a Basement? Can we put up fences/decks/sheds? Yes, as long as lot improvements fall within the RM of Loreburn Bylaws, Zoning and the Sunset Beach Building Specifications. Can we plant trees and shrubs on our property? Yes! Trees, shrubs and landscaping are welcomed and encouraged. Septic: What are the requirements for wastewater management? An approved septic holding tank is required for wastewater management. Wastewater removal is readily available from local haulers with agreements to dispose in the Village of Elbow lagoon on a fee-for-service basis. Fresh water: What are options for water service? Owners will be required to install water holding tanks. Treated water is readily available from the Village of Elbow by local suppliers on a fee for service basis. For drilling a new well, you need to apply for a Permit to Conduct Ground Water Investigation to the Water Security Agency. Sunset Beach well water success was achieved in the fall of 2018 by All Out Drilling. For details please contact Brody Ellis at (306) 948-9307 or visit their website. Will there be water available for watering grass and trees? Yes – we are currently exploring all options for our valued property owners. Several convenient water fill locations are available nearby and we are exploring alternative irrigation opportunities. What fire suppression services are available? Sunset Beach Fire suppression services will be provided by the Village of Elbow Fire Department under agreement with the RM of Loreburn. What are the garbage disposal requirements and options? Sunset Beach property owners will be considered residents in the RM of Loreburn and therefore are allowed access and use of the solid waste transfer site in the municipality. The municipality still operates a waste disposal grounds located on NW 01-27-05 W3. It is open to R.M. of Loreburn residents for disposal of domestic waste, wood and steel. There are designated sites for each type of waste and it must be sorted. The municipality has placed a red Loraas bin at the waste disposal grounds to help with the removal of items that cannot be put in the designated areas. The municipality does not accept tires, construction rubble, hazardous waste of any kind, concrete, used oil or containers at the site. Burning is prohibited at the disposal grounds. There is an employee of the RM that works at the Waste Disposal Site to help with the selection of what can be taken in at the grounds. Current hours of operation can be found on the RM of Loreburn website under Services. Recycling: what are the local recycling options? The Municipality now has a Loraas Recycle bin at the nuisance grounds/solid waste disposal site. Some items which may be placed in the recycle bin included: flattened corrugated cardboard and paperboard, newspapers, flyers, magazines, telephone books, brown paper bags, paper egg cartons, aluminum cans, milk cartons, juice cartons, plastic drinking bottles, plastic grocery bags, and glass bottles. Do not bag or tie paper materials and clean and rinse containers. For more information contact the RM office (306) 644-2022. For more information click here to visit service page for RM of Loreburn Waste Disposal Services. How do I set up SaskPower electrical service? We are pleased to offer upgraded power infrastructure at Sunset Beach. Each property includes a supplied and installed power pedestal (100/200 amp service) trenched and in place, ready for meter placement and use. Lot owners simply need to contact SaskPower to establish their account number for electrical service. Each lot has already been assigned an individual Notification Number that we will provide to you to make electrical service establishment easy. 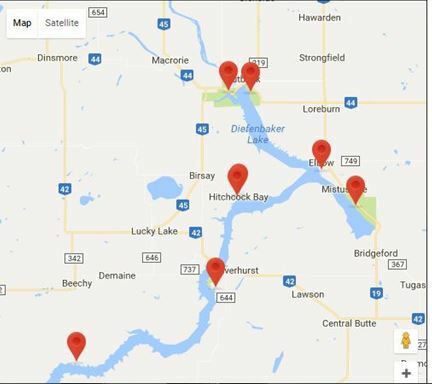 A SaskPower representative will ask for the Notification Number, Lot Number, Block Number in the Sunset Beach Subdivision, and Plan Number in the Rural Municipality of Loreburn No 254. Will SaskEnergy service lots with natural gas? No, natural gas is not feasible at this time. However, propane is a permitted, viable and cost effective alternative. Heritage Propane services the Lake Diefenbaker area. Contact Rob Brockman at 306-231-5344 or at HeritagePropane.ca for more information. The Sunset Beach at Lake Diefenbaker Subdivision is in the RM of Loreburn #254. Taxes are based on an assessment of the lot and any subsequent property development, and are paid to the RM of Loreburn. 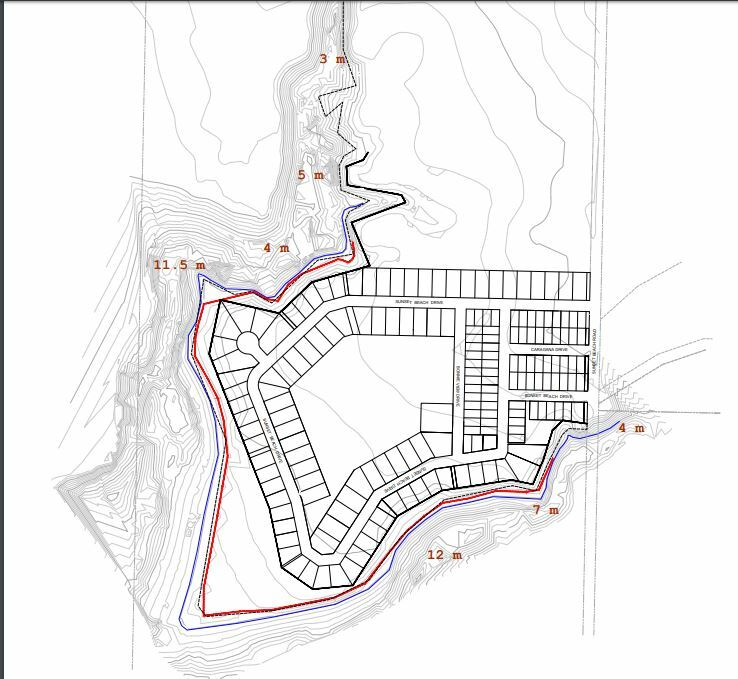 Current examples from the RM of Loreburn in a Resort Residential Zoned Development can be found here. Please contact the RM of Loreburn for further details. Are there any property owners association fees or annual maintenance fees? No, there are no annual fees to the developer. Annual property taxes are payable to the RM of Loreburn; please contact the RM of Loreburn. Are Quads, ATV’s and Golf Carts Permitted at Sunset Beach? Yes. All applicable federal, provincial and municipal legislation, including the RM of Loreburn Bylaws, must be adhered to. The developer does not have use restrictions at Sunset Beach related to quads, ATV’s and golf carts. Sunset Beach is on the Trans Canada Trail (also known as the Great Trail): one of the world’s longest networks of multi-use recreational trails. Just up the road from Sunset Beach is a must see destination for recreational trail enthusiasts: the Elbow Trail. Part of the Trans Canada Trail, the Elbow Trail spans 6 km along the beautiful shoreline of Lake Diefenbaker, from Tufts Bay to the marina and Harbor Golf Course clubhouse. Developed by Elbow residents, business owners and vacationers, this packed-earth trail is operational year-round. Hiking, cycling and jogging are encouraged in the spring, summer and autumn months, and skiing and snowshoeing in the winter. Parking lots are available at both Tufts Bay and the golf course clubhouse and a mowed grass area is available for parking mid-point along the trail. Users of the trail have amenities close at hand, from the golf clubhouse now open year round, to the many restaurants, lodging options, stores and watering holes found in the town of Elbow itself. Bet he never dreamed it would end up on Facebook! Perhaps my new mini van needs a Sunset Beach vehicle wrap Elsa? Graphic Ad Ltd.